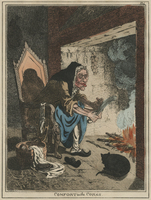 Gillray, true to the form of caricature, exaggerates the size of the woman's features and the knife she uses to rid herself of corns. 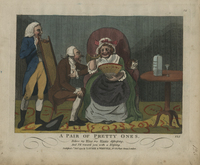 In 1796 Elisha Perkins, a physician from Connecticut, patented the metallic tractors shown in this print. 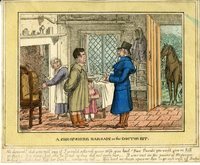 He claimed the tractors could cure disease through electric force. 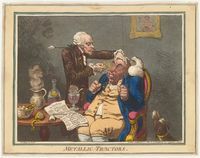 Gillray's skepticism of this treatment is clear in this satire. 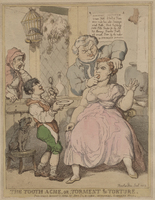 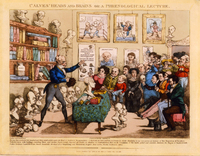 Rowlandson comments on dentistry in this work, suggesting that treatment in the days before anesthesia was as painful as the ailment.